For the most part it didn't really look like it was going to do anything for him, until the late laps when Sebastian Vettel on a very stretched out strategy homed in on fresh supersoft tyres (Ferrari for about the only time this year getting its pit wall call correct). Seb attacked and indeed got alongside Nico at one point, and what will have concerned Nico even more is that Max Verstappen was stalking the pair of them, not far behind, and had both passed then the title would have slipped through his fingers. "Crazy Max was after that!" said Nico light-heartedly later, "You can't let anyone past!" "So intense. Really intense. I have never felt anything like that in the car" he continued, getting serious. "Many moments were not so enjoyable, especially in the race, it was very tough, with Verstappen at the beginning and in the end of course - not nice. "It was definitely not the most enjoyable race I've ever had." The Mercedes engineers got progressively more agitated at Lewis's antics, particularly in the late laps outlined, talking haughtily on his radio of "instructions" to speed up and that the race win was under threat. Though quite why they thought Lewis would take any notice, or be deterred by the thought of others getting into the mix, is anyone's guess though. On the contrary other cars around was in his interests. There has been the usual, inevitable, moralising, and as ever Lewis's presence guarantees extra lather. But any F1 driver would in that situation have tried similar. The good ones anyway. 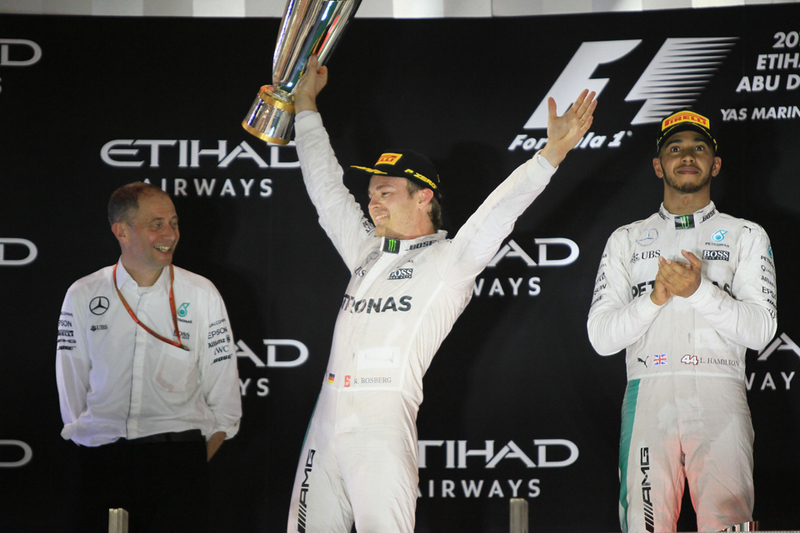 Team boss Toto Wolff, while appearing ticked off, also appeared to empathise grudgingly with the Englishman. "I was in a bit of a schizophrenic situation," Wolff said. "There's the control freak, team leader, that has a rulebook and everyone has to obey it - and that's how we got to where we are. "Then there's the racer in me and I was questioning what I would have done...I'm a little bit in two minds. "It would have come to my mind [to back him up] and it came to others' mind." Even Nico accepted that Lewis was within his rights. 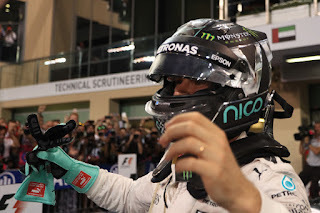 "Lewis was trying to back me into everybody else as that was the last chance that he was trying to use" said Rosberg, "and he did it really really well. "Lewis was using all his skill to do it perfectly so no way for me to get by. I thought about it but it was pointless. There was no way, he did it in a perfect way." Lewis as you might expect was resolute on the subject meanwhile. "There's no point just sitting out front and leading the Grand Prix and coming second [in the championship]", he asserted. "I won today...I did everything with the opportunities that I had. "I don't know why they [the team] didn't let us just race" he added elsewhere. In any case, what we got in the season's climax was close, tense and rather excruciating. But Nico held the rest off, and all that really matters now is that the championship that he led for so long is now his. 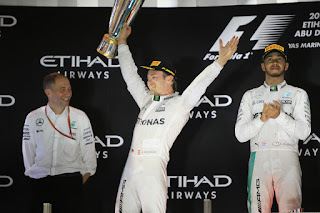 For all that people will argue - about Nico's potential, about Lewis's tactics, about luck or whatever else - that bald status cannot be disputed. And even focussing solely on today Nico never seemed to lose his composure when Lewis applied the screws on him, and he even threw in a fine and bolshy overtake, on Max Verstappen of all people - the F1 equivalent of the hind legs of a mule when one is seeking a way by. "The team said to me 'it's critical to pass'", said Nico. "Critical for the championship. So I tried to get past, I knew it was going to be difficult, I gave it everything, he gave it everything and it worked out. "Jesus. Max, of all people..." he added. Resilience, thinking, and no little pace and aggression. The race in its own way summed up why Nico's a deserving champion. "It's ridiculous," Nico added. "I can't believe it. I can't wait to celebrate with my team and all my friends." Lewis, while disappointed, paid tribute to his stable mate. "I did everything I could", he said. "Big congratulations to Nico, he did everything he had to do this year, and he drove fantastically well to win the championship." 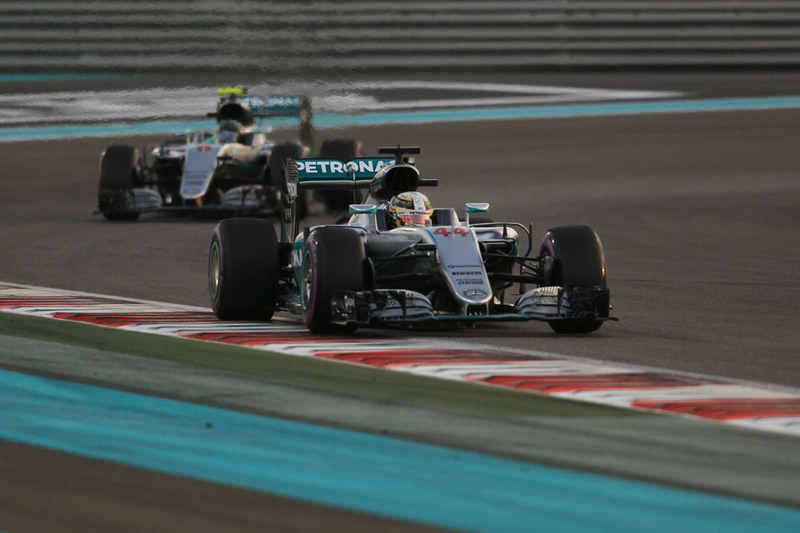 Lewis's approach meant the Mercs, Red Bulls and Ferraris were bunched for the most part, and indeed just over five seconds covered the first five home. Vettel we've mentioned, as we have Max, whose drive was even better than it would appear on the topline. He spun at the first corner (which looked his own misjudgement) but then recovered in fine style on an unlikely one-stop strategy. Indeed as intimated he ran ahead of Nico for a time, much to the detriment of the latter's blood pressure. Not for the first time we're left to reflect that for all we associate Max with the spectacular he's also possessed of a delicate touch on the rubber too. Daniel Ricciardo followed them home for P5, with smart strategy getting both Red Bulls ahead of Kimi Raikkonen's Ferrari - though as noted Ferrari returned the compliment to the Bulls later with Seb. 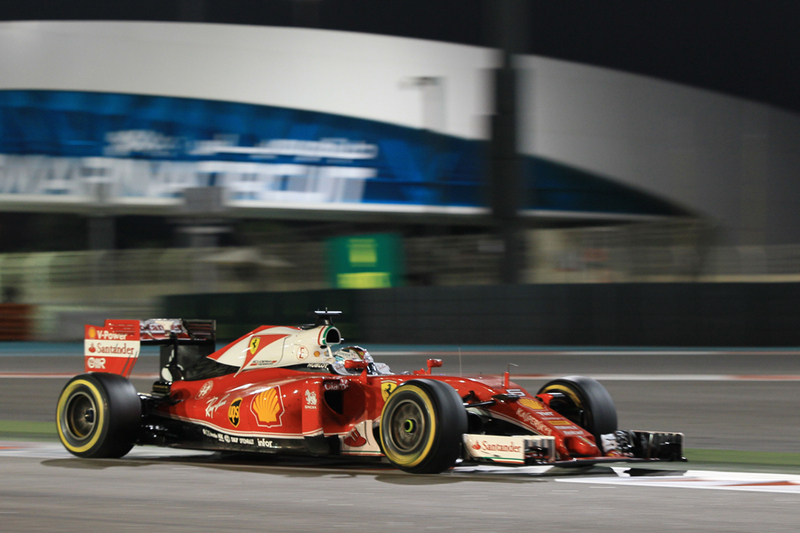 Kimi was in the mix for much of the way, though finished in P6, 13.5 seconds adrift of Ricciardo. The Force Indias with Nico Hulkenberg ahead followed them in at a distance for the next two places, more than cementing the team's richly merited fourth place in the constructors' table. Then the bowing-out Felipe Massa, and his old mucker Fernando Alonso attacking him at the last, completed the scorers. As noted, it was not merely that we're at the end of the sport's longest ever season that made this one seem drawn out. But for Nico the end result is the same. That which he's dreamt of from an early age. That will live on long after the arguments of the moment have subsided. Yes, Just like in 2008 when the driver who had the most wins and two DNFs lost out to the driver who had one less win and one less DNF - really need to put an asterisk against that year. Yep, it's happened plenty in F1 history. It's that an F1 season, even at 21 races, isn't nearly long enough to ensure that random chance with DNFs etc will even out necessarily. And as a result it's happened plenty that the WDC hasn't won the most races. In the 1980s it happened six times in eight years!